The title of my artwork is "Salat" which means "Prayer". 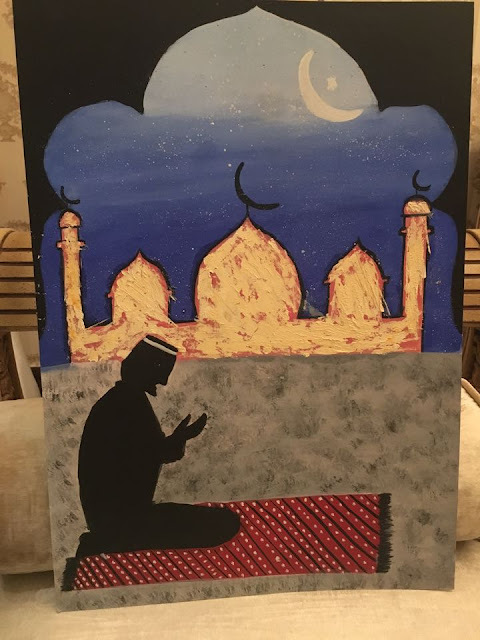 I chose this title because it represents my painting as there is a silhouette of man shown praying in front of a mosque. This title is also very symbolic as it is the first pillar of Islam. The style I used is free hand drawing and painted it with oil paints. I used the “stroking” method in which I used a thin brush and kept stroking it to give a strong impact for the blue sky. I also used “knife painting” to show the rusty beige effect for the mosque with a pink base to add color. The knife used has a pointed tip, and a lowered trowel which suited my painting on canvas. The blade can be of different lengths and shapes: triangular, rectangular or more diamond like. I also tried to give the floor a marble impression by painting it grey and using a sponge to make it realistic. I intentionally used the blue sky as “blue” is depicted as peace for me. I did not give my figure an expressions or facial features as I wanted my audience to concentrate on the bigger picture rather than the smaller details. We were asked to draw anything related to 'Peace and Islam" which actually mean the same thing. The first thing that came to my mind was praying because that’s the first thing you do to devote yourself to God. The importance of the prayer in Islam cannot be understated. The importance of the prayers lies in the fact that no matter what actions one performs in his life, the most important aspect is one’s relationship to God, that is, one’s faith (imaan), God-consciousness (taqwa), sincerity (ikhlas) and worship of God (ibaadah). This relationship with God is demonstrated and put into practice, as well as improved and increased, by the prayer. Therefore, if the prayers are sound and proper, the rest of the deeds will be sound and proper; and if the prayers are not sound and proper, then the rest of the deeds will not be sound and proper, as the Prophet himself stated. Praying makes me feel at peace, it makes me feel at ease. It helps me talk to someone and let out all my feelings. It helps me realize that there is a greater being in this world that is looking out for us and that is God. Vancouver-based artist Mohamed Somani is an artist that inspired me to paint this piece. Somani finds inspiration in the Qur'an and Muslim history, and evokes some of these stories on canvas. I loved the simplicity of each of Somani’s paintings; it has a powerful message even though it’s quite simple. That’s what I look for in an artist, someone to inspire you to draw and paint better in the most beautiful ways. I looked at a few artists who drew the Taj Mahal. The Taj Mahal would be significant as I tried to replicate the tarnished look for my mosque in the painting. A few artists had mastered “knife painting” really brilliantly and I was truly inspired to try it out. My name is Riya Berry and I am originally from India but born and brought up in Dubai. I’ve grown up and evolved with Dubai itself, I have seen it change drastically and become bigger and better each year. Being such a multicultural society, Dubai has taught me how to respect each one’s culture. Being in this class reminded me of how much I love the culture here and how much it has influenced me as a person. Since I am Indian, I do not know much about Islam and neither so much about art but being here and actually drawing and painting about “Peace and Islam” really brought the best out of me.